MIKE HURST the former SPRINGFIELD and Record Producer who has in his lifetime produced (and played and sang) on over 1500 tracks with 50 TOP 40 hits under his belt from artists such as CAT STEVENS, PP ARNOLD, MANFRED MANN, MOVE, MARC BOLAN, SPENCER DAVIS GROUP, CHRIS FARLOWE, SHOWADDYWADDY, FANCY, CRICKETS, NEW WORLD, SHAKIN STEVENS. 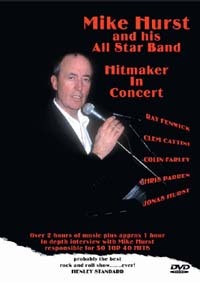 The concert featured on the DVD was recorded during January 2003 at Henley On Thames, England to a sell out audience. This is a DVD of a sell out concert performed earlier this year by a man and his band who have four decades of experience in rock music...One for the more mature rocker!